NEW CLEANING SERVICE AVAILABLE: if you're having pre-wedding photos done, and happen to get your gown soiled before the wedding, please call us to schedule a hand pre-cleaning to get your gown back in the tip-top shape it should be for your wedding day. 1. Why should you bother having your gown cleaned and preserved? Because you spent hours, maybe months, selecting THE gown that would make your dream wedding day come true. It was one of the most emotional choices you made in your wedding planning. And if you even sew a button on something from time to time, you know that YOUR gown is a work of art, by someone who worked intensely, by hand, on the beading and embroidery and lace applique work. And perhaps one day, you will want to pass it on to a sister, niece, cousin, daughter... or have it made into your daughter's christening gown. And when you do have your gown cleaned and preserved, please be sure to check the box on arrival and ensure YOUR gown is in the box !! 2. What got on your gown? The day of the wedding, some or all of the following elements inevitably got on your gown: mud, parking lot grease, floor dirt from the reception site, grass stains, food, wine, champagne, chocolate, Aunt Helen's lipstick, makeup, etc. 4. Are there differences in gown cleaning services? Absolutely. Some places will sell you a box kit ($89-119), for YOU to ship the gown out to a professional service. You take care of the packing, paperwork and the drive to the shipping site. Does the box seller care how your gown comes out? NO, NO, emphatically NO. Their job was to sell you the box, not insure your gown would receive the best service possible. 5. What will happen if I just have it drycleaned locally? Maybe some of the stains will come out. Maybe they'll even box it for you. With just plain drycleaning, YOU GET NO GUARANTEES against carmelizing, discoloring or rotting. 6. Is there a guarantee from the local drycleaners against yellowing and fabric rot? NO. Is it in an acid-free box? PROBABLY NOT. Does it have to be sealed? You should ask. 7. 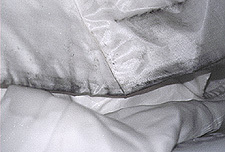 Is there a right way to have my gown cleaned and preserved? ABSOLUTELY. 8. What do WE do differently? We treat every gown as if were our very own. When you choose our DELUXE processing service, every gown is precleaned by hand here first, never thrown in the washing machine. When it's finally bone dry and we're satisfied that we've done OUR best with it, it's sent to a GREAT preservation company for a second full cleaning, and the actual preservation. They will give your gown a thorough going over, treat it with a solution to prevent damage, then box your gown properly, to prevent mildew, fabric rot, discoloring and more. And they'll give you a GREAT guarantee. So, if you'd like your gown done RIGHT, the first time, please contact us. Call today (315) 437-0030; or email us -- you'll be glad you did! FREE ESTIMATES gladly provided. The Bridal Connection .. (315) 437-0030 where all great weddings begin! Does your gown look like this? There is hope! Only at The Bridal Connection will your gown receive a meticulous hand cleaning to remove all this and more. Our price to you is very competitive, and if you select the DELUXE method, we know you'll be thrilled with the extra special attention your gown is given .. and the price includes cleaning, preserving, boxing and shipping (both directions) ... and a wonderful warranty from the preservation service provider, too! Our bridal gown service providers offer you the best in the business. They are trusted companies who have been in business over 75 years! We make getting your gown taken care of AFFORDABLE and CONVENIENT. And by offering you a budget service, and a DELUXE method, you get to choose what works best for you! Make "from this day forward" a day to remember by preserving your memories AND your gown. Call The Bridal Connection @ 315-437-0030 today or e-mail us at thebridalconnection@yahoo.com.